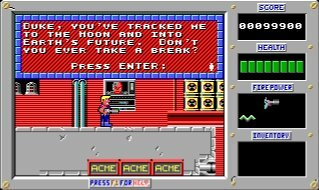 The recent release of Duke Nukem Forever got me thinking back to the original game and how many hours I sunk into as a child. 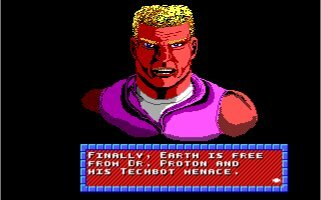 (If you are thinking I mean Duke Nukem 3D, I shake my fist at you and yell “Get of my lawn”!) As with many games at the time, I only had the shareware version and not the complete game. So I decided it was time to relive my youth and obtain a copy of the complete game. Time to crank up DOSBox and get playing! 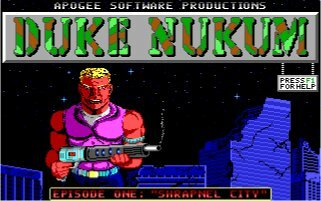 The original Duke Nukem had three “episodes”; Sharpnel City, Mission: Moonbase and Trapped in the Future. The first episode was the shareware game many people would have played. Set in the futuristic time of 1997, Dr. Proton was brain damaged in some sort of nasty radiation accident (not ironic despite his name, as there apparently was a name change there…) and developed an army of evil robots to protect his base. The military have failed to overcome such evil so the C.I.A. have stepped in and hired our hero! Anyway, moving on to Episodes 2 and 3 that I had not played before. There is nothing new in game play in these episodes, only slightly different scenery. In Episode Two: “Mission: Moonbase” (yes, multiple colons in the title), Duke follows Dr. Proton to his moonbase using his time transport machine. That is right… time transport to get to the moon. The second episode was rather non-challenging – I died once for the entire game. You get pistol upgrades all over the place so enemies are readily defeated. I found more than the three you need to fully upgrade your pistol and I hardly explored everywhere. I was also slightly surprised the “Super Jump Boots” were not given in an early level given we are on the moon. The only real challenge was the level designer was obviously bored with having nothing new to work with, so just made larger mazes and put more bad guys everywhere. That does not so much increase the difficulty but rather just makes the game longer. Only on one level was the path to take in the maze not particularly obvious. A little more than two hours of game play and I had beaten Dr. Proton again. That boss battle was also poorly programmed as I noticed Dr. Proton flies up and down in the room in front of you and you can just stand back and shoot without going near him. I was far too manly to do that and attacked the good old fashioned way and just ran in guns blazing. Episode Three: “Trapped in the Future!” sees Dr. Proton escape to the future in his time machine. Duke immediately follows without so much as a short rest even though he would much rather watch Opera. He is obviously not the brightest guy… he could assumably still watch Opera and then go to the point in the future where he was needed at his leisure. Again, nothing much changed in the third episode. The mazes got more annoying (when you start right beside a keycard access point, you know you are going to have to walk all the way back once you collect the key…). The main difference was that in the future there seems to be some horrid green colour to everything and so some levels are hard to look at. Also, random spikes are put everywhere on the ground so when you jump or drop down blindly to the next platform, you are going to take damage. No way to avoid that either as you can not take a look around slightly off screen before jumping there. This episode also appeared to be much shorter to me. 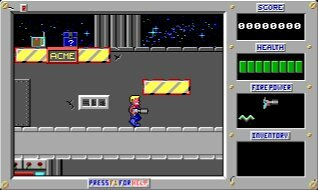 I did try exploring most places, but obviously I was not very thorough as when I (very unexpectedly) arrived at the final fight with Dr. Proton, I did not have a fully powered up pistol. I did die a couple of times on the final fight, so there was some increase of difficulty. Although both of those were due to shear surprise that as soon as you drop into the final room you are being blasted by some flame and the boss is right above you and there are spikes everywhere you look to hide. As soon as I realized I just needed to get to the other side of the room, turn and shoot, Dr. Proton was soundly defeated. Overall, I enjoyed coming back to play Duke. I do not think it is just nostalgia talking when I say the first episode was still the most enjoyable. I think the younger me would have been disappointed if after playing the first episode for free, I had then purchased the next two episodes. They just did not seem to have the same polish. I imagine the game developers being told “Great game. We are going to give it away for free. Make us two more quickly so we can sell them and actually make some money.” and them looking at each other and thinking “You could have mentioned this earlier…”. But this has not put me off playing the rest of games that I only had the shareware version years ago. Next up is the three episodes of “Commander Keen: Invasion of the Vorticons”. Yay pogo sticks! Allan, I’m going to try to ignore your fist shaking because we do have something in common here..
Only a few weeks ago I played duke nukem (3D) again. fun, nostalgia, cool, blah blah. Well, I played the atomic edition this time which featured some new stuff. (and this time, I completely finished all levels. as a kid I only finished 1 or 2 episodes). It did get a bit boring after a while though. Especially the atomic edition levels were a bit lengthy, but hey.. I also recently played Carmageddon 2 “carpocalypse now” again. that was brilliant. That game always had a great gameplay, not to mention graphics and physics (damage model!) which was way ahead of its time. And I read a few days ago they’ll release a new carmageddon game. But in this case, it’s the original developers who bought the IP back and will do the sequel. So it should be good. Unlke duke nukem forever.. So there, shake your fist all you want. But just as you, I had a great time replaying 2 of my all time favorite games.